The Korg DRV-2000 Digital Reverb is a creative digital reverb that responds like a musical instrument – because it responds to the way you play. The Korg DRV-2000. Much more than a professional 24-bit digital reverberation unit. Much more than a MIDI compatible multi-effects unit, featuring 16 programs like Gate Reverb, Stereo Echo, Flanger, Space Pan, and dual effects programs like Reverb and Echo and Reverb and Chorus. Much more than a creative sound-processor that lets you program and store up to 80 of your own effects. The Korg DRV-2000, like a musical instrument, can actually be controlled by tile way you play. We call it Multi Modulation. It enables you to modulate parameters such as Reverb Time, Pan Speed, Echo Feedback Level and Gate Shape by the level of your playing, whether you play electric guitar sampling keyboard, sax or even drums. Each of the DRV’s 96 powerful effects programs (16 presets, 80 User Programs) can respond to your playing just as expressively as your own instrument does. MIDI users can modulate the Korg DRV-2000’s effects by MIDI touch sensitivity and a full range of MIDI controllers. You can also use optional foot controllers for Multi Modulation, as well as for selecting programs and cancelling effects, leaving your hands free to play your music. The Korg DRV-2000 Digital Reverb – it responds like a musical instrument. The Korg DRV-2000 allow’s you to select, for each effects program. two parameters 10 be controlled by Multi Modulation You can then select a control source Irom Ihree calegones. For each parameter, the Multi Modulation sensitivity can be set anywhere from – 100% to + 100%. For example, you could control Reverb Time by MIDI Key Veloclly. Set the Multi Modulation sensitivity 10 +100% and the Reverb Time will increase as you play louder, to add power to dynamic solos. Set the sensitivity to – 100% and the Reverb Time Will Increase as you play more softly, to add atmosphere to quiet passages. On all programs, you can Multi Modulate the Input level or Output level, so that you have complete control over the overall level of the processed-soundfdlrect-sound mix from your Instrument. And when you change programs (using an optional foot switch) the parameters that you have selected for Multi Modulation change automatically. The Korg DRV-2000 is designed so that during performance you need never touch the controls on the main unit – you’re totally mobile. With the DRV -2000. control of digital effects is not Just lor MIDI users. 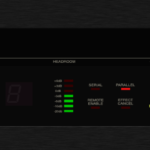 Arrt player can control parameters list by the level of their Playing. Natural, realistic effects can be created, such as having the Reverb Time increase when you play louder. Special effects are easy too, like Multi Modulating the Space Pan so that when you turn up for a solo, the sound pans dramatically between your speakers. You could take advantage of the Korg DRV-2000’s variable Gate Shape feature and use Input level to modulate the Gate Reverb program so that your playing actually affects the type of reverberation that you hear. Another plus for non MIDI users. A volume Pedal such as the Korg KVP-001 can be used to control any two selected parameters. For example, a pianist could use a volume pedal to increase the Reverb Time of any of the DRV-2000’s six natural reverberation programs, to instantly add just the right amount of ambience to his sound or an electric guitarist could use a volume pedal to simultaneously control the speed and depth of the Flanger program. Controlling Echo Feedback by the Pitch Bend controller of your synth. This lets you lengthen echo on high lead lines, then shorten echo to prevent muddying of lower pitched passages. Using a MIDI drum machine such as the Korg DDD-1 Dynamic Digital Drums to control Reverberation Time. You can set each instrument on the DDD·1 to transmit a different MIDI Note Number, automatically varying the reverb effect a long, thunderous reverb on the snare, medium reverb on the Toms, short reverb on the bass drum. Selecting MIDI Note Number for Multi modulation so that the depth and rate of chorus or flanging varies according to the pitch of the notes you play on your DSS-l Digital Sampling Synthesiser or any MIDI keyboard. The Korg DRV-2000 is principally a powerful, state-of-the-art digital reverb unit. It provides remarkably rich stereo digital reverberation which will enhance any performance and add natural acoustic ambience to recordings. The six reverberation programs all feature an “Earty Reflection” parameter, realistically creating the initial sound reflections occurring in various environments, from a large concert hall to a garage. There are also Reverb programs especially designed for vocal and instrument sounds. It also provIdes a number of other superb effects programs. You can edit (modify) any of the Korg DRV-2ooo’s programs, to create up to 80 of your own programs, to exactly suit your needs. The Gate Reverb programs let you create a popular studio- type effect (for that Phil Collins drum sound) where a long reverb is abruptly and dramatically cut short. And you can vary the shape and length of the gate, from normal reverb, to straight gate, to reverse gate, for a variety of powerful contemporary effects. Three types of Stereo Echo, utilising different types of signal routing, permit an enormous range of tape-echo and digital delay type effects, with time and feedback level of left and right channels independently adjustable. The Space Pan takes automatic pannlflg to new dimensions-its Pan Depth parameter allows you to create a circular panning effect, by increasing or decreasing the signal level on alternate passes of the centre position. And of course this effect is widely variable in rate and depth. The DRV-2ooo’s vibrant Reverb & Echo program permits the creation of really rich, natural reverberation treatments by combining, in parallel, a reverberation effect on the nght channel with a delay/echo effect on the left channel. Routing your input signal first to a reverb processor, then to a stereo chorus processor, the Reverb & Chorus program adds a thick, deep modulation effect to multiply and transform the tone of any instrument.